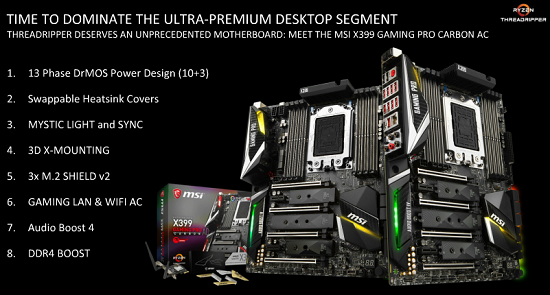 Motherboard manufacturers have detailed their next generation products based on AMD’s X399 platform at “Meet The Experts” webinar. The webinar lasted for a while and motherboard makers got the opportunity to detail their upcoming products that will support AMD’s Ryzen Threadripper processors. 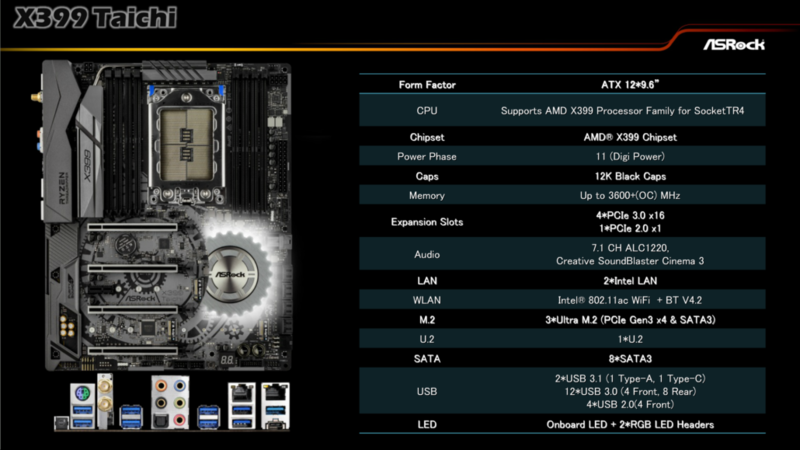 The motherboards that have been detailed are from MSI, ASRock and Gigabyte. All vendors will be offering the motherboards with full support for Ryzen Threadripper chips in the coming weeks and will go on pre-order in less than 24 hours. It should be noted that AMD Ryzen Threadripper CPUs will hit retail on 10th August and are aimed at enthusiasts and users who want higher number of cores to crunch multiple tasks at once. 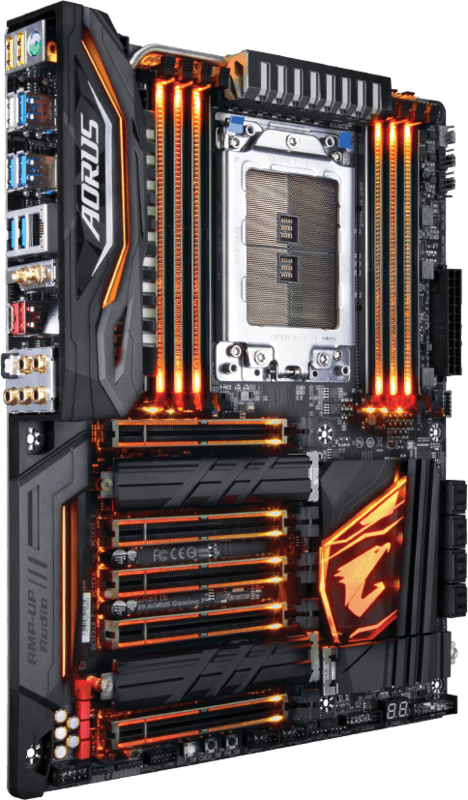 Coming to the motherboards, we will start off with AORUS series from Gigabyte. 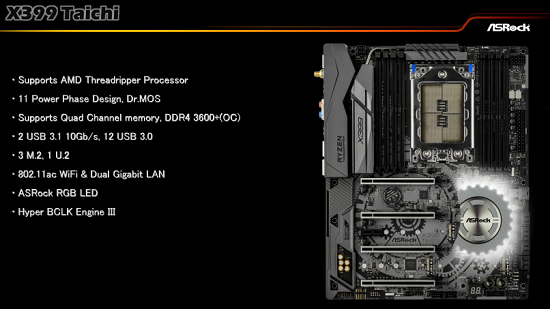 The Gigabyte X399 AORUS Gaming 7 is the flagship motherboard of the lineup. 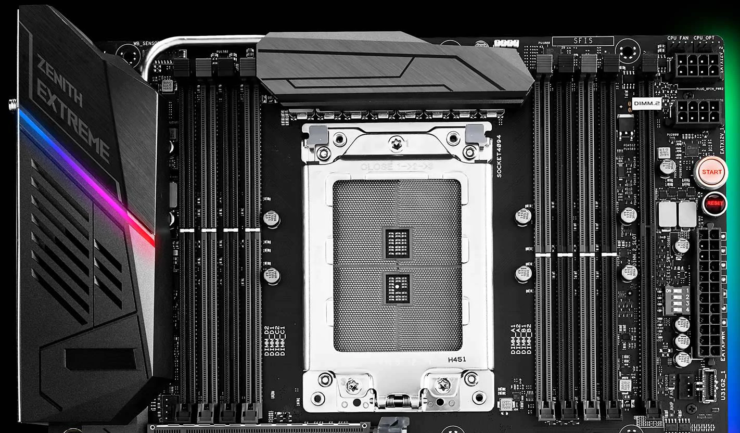 In terms of design, the X399 AORUS Gaming 7 has a standard ATX design with the largest consumer socket we have seen to date, the TR4. The TR4 is a lot similar to the SP3 socket which is designed for the EPYC server platform and feature 4094 pins in total. The socket is surrounded by eight DDR4 DIMM slots that can support up to 128 GB of ram. The motherboard has a solid power delivery system which is delivered power through an 8 and 4 pin connector configuration. The power delivery system is cooled by two sets of aluminum based heatsinks. What’s interesting is that the X399 platform will feature up to 64 PCI-e Gen 3.0 lanes vs 44 max PCI-e Gen 3.0 lanes on Intel’s X299 platform. 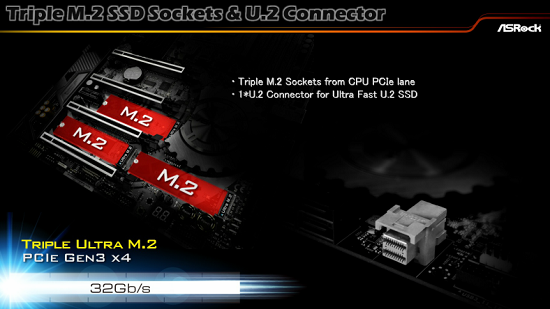 Expansion slots include four PCI-e 3.0 x16 slots and triple M.2 slots. For storage, we are looking at 8 SATA III ports along with tons of connectivity on the I/O panel and PCB for users. The rear panel includes 8 USB 3.0 ports, two USB 3.1 (Type A + Type C) ports, a 7.1 channel audio jack, a single LAN port and PS/2 connector. 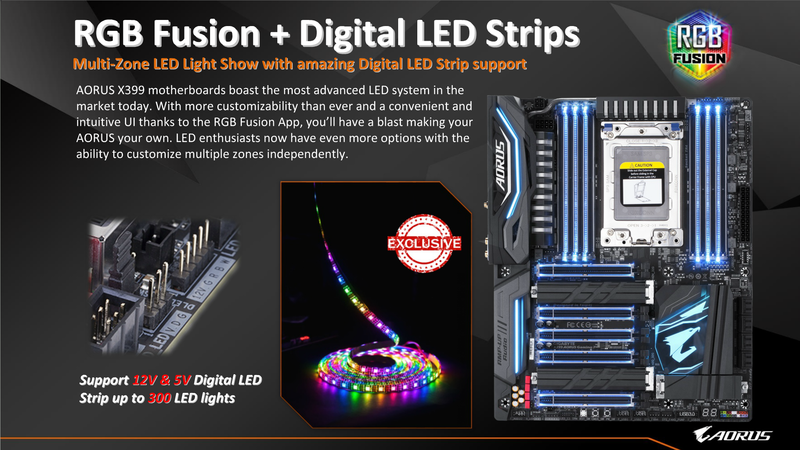 The motherboard is fully compliant with Gigabyte’s AURA RGB LED lighting system which looks tremendously great on their new HEDT flag ship products. If you pre-order the motherboard, you will be applicable to the Xpedition Pack promotion which grants you either a Kingston HyperX Cloud headset or a Steam $50 US voucher code which is splendid. 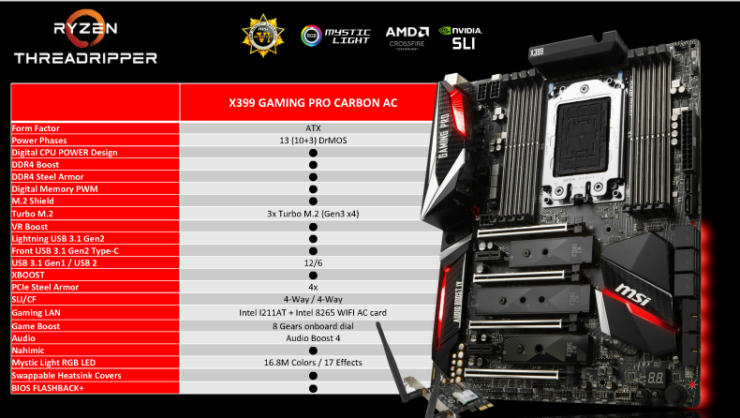 The MSI X399 Gaming Pro Carbon AC is another impressive product based on the new AMD HEDT chipset. 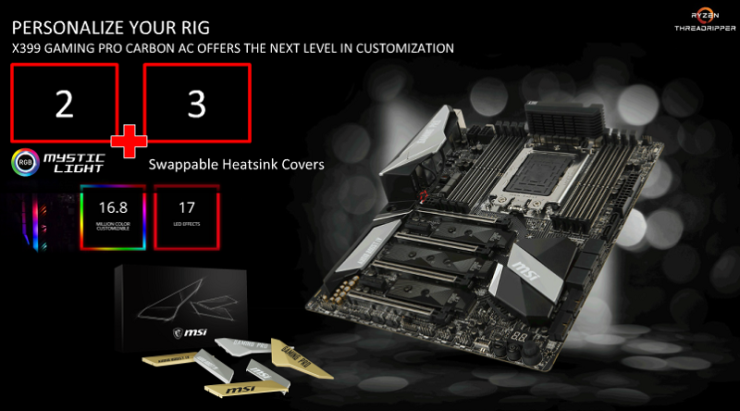 It features the TR4 socket which fully supports the AMD Ryzen Threadripper processors. 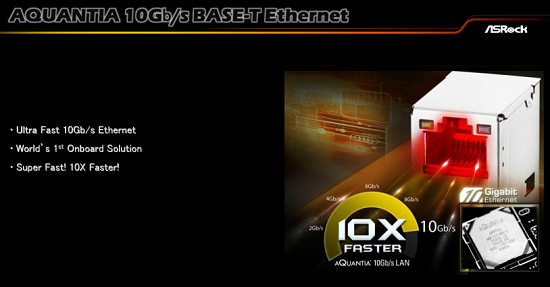 It comes with quad channel DDR4 memory support and has eight DDR4 DIMM slots scattered across the socket. The CPU is powered by dual 8 pin connectors which provides a massive influx of power to the board. 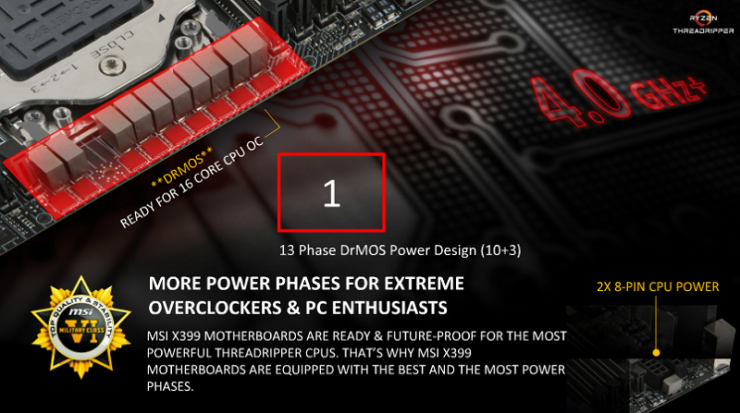 HEDT users and overclockers will definitely enjoy the 13 Phase (10+3) DrMOS power delivery system which ensures a lot of power being delivered to the socket for overclocking needs. 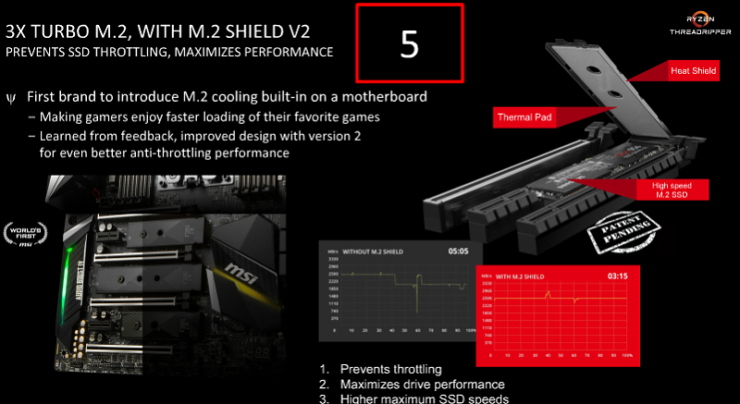 For expansion slots, we are looking at four PCIe 3.0 x16 slots, two PCIe 3.0 x1 slots and triple M.2 slots with MSI’s latest M.2 Shield V2 revision. The motherboard has a nice color design and has a number of swappable heatsink covers that are included in the package. The motherboard has 8 SATA ports and two USB 3.0 front panel headers that are right angled for easier cable management inside the casing. 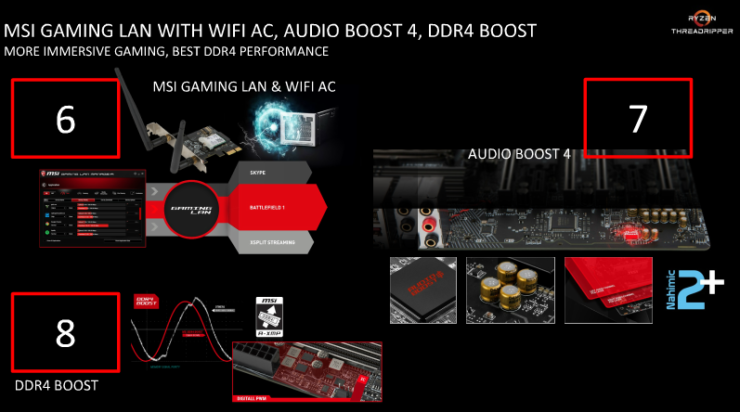 MSI ships the motherboard with a LAN and WiFi PCIe card along with the added features such as Audio Boost 4 and there’s also support for 3D mounting for users who are going to be interested in it. In terms of rear panel I/O, the motherboard comes with 12 USB 3.1 (Gen 1), 6 USB 2.0 ports, LAN Ethernet port, USB 3.1 Type A and Type C ports and a 7.1 channel HD audio jack. 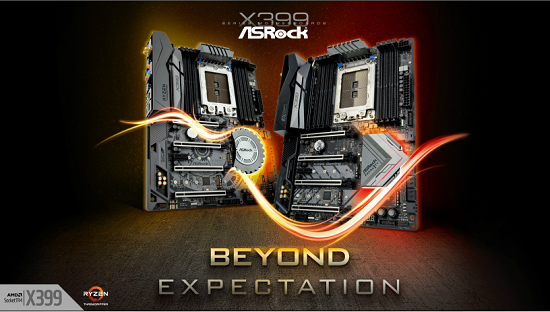 ASRock is also showing not one but two high-end X399 products which they have shown at their Computex booth previously. 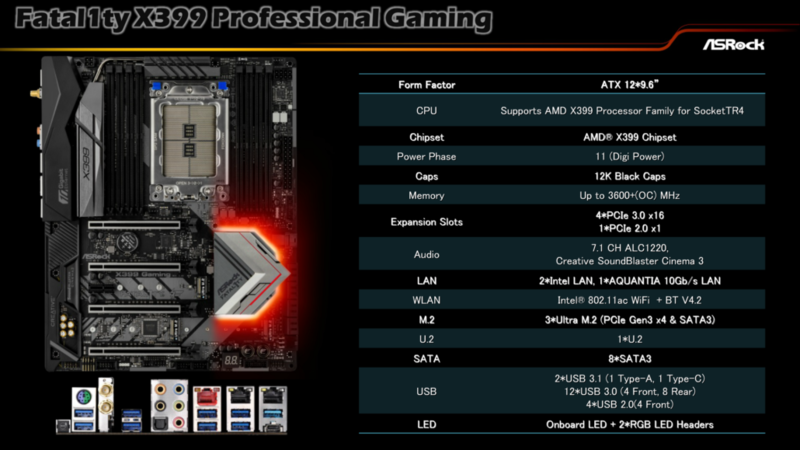 These include the ASRock X399 Professional Gaming and the ASRock X399 Taichi. 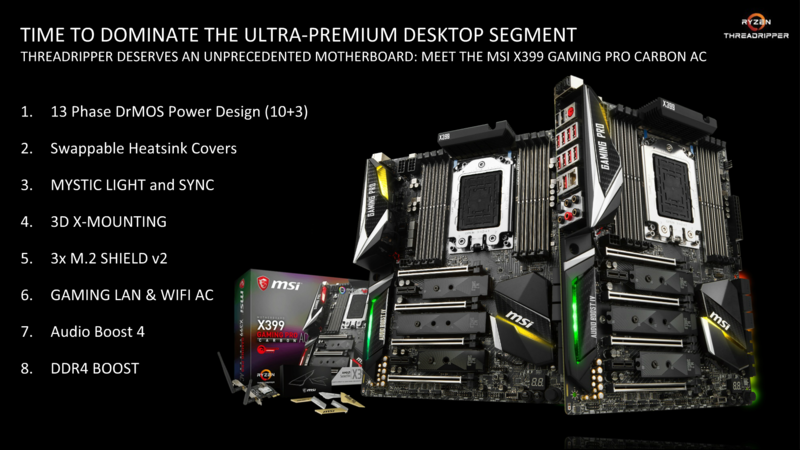 Both motherboards come with a very similar design scheme. The X399 Professional Gaming features the TR4 socket and a 11 phase Digi power delivery system. Power is provided by a 8 and 4 pin connector configuration and there are a total of eight DDR4 DIMM slots that can support up to 128 GB capacity in total. 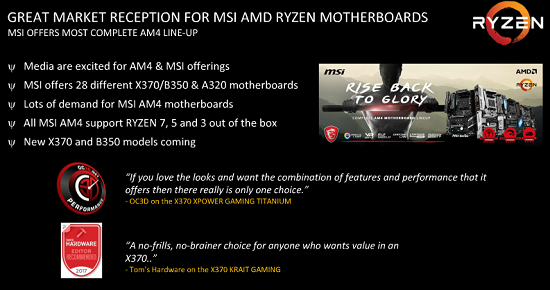 The motherboards can support memory speeds of up to 3600 MHz (OC+). 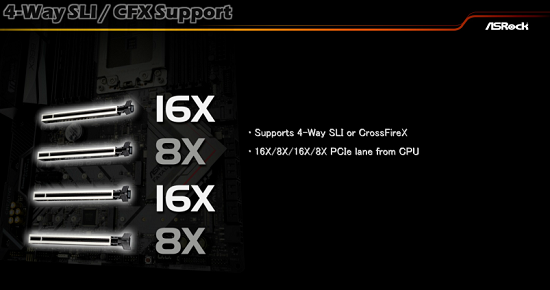 The motherboards packs four PCI-e 3.0 x16 slots, a single PCI-e 3.0 x1 and three M.2 slots. Storage includes 8 SATA III ports, a single U.2 port, dual USB 3.0 ports and we can also spot a 6-Pin power connector to juice up the expansion slots when running multiple array of discrete graphics cards. 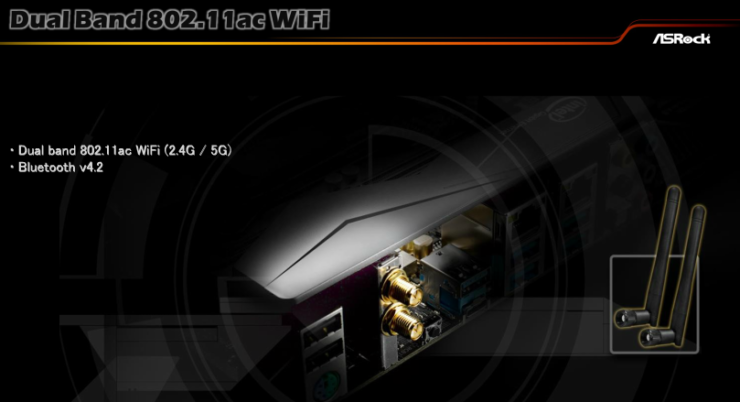 The ASRock X399 Taichi on the other hand has virtually the same specifications but a different back panel layout which includes 10 USB 3.0, 2 USB 3.1 ports, dual Gigabit Ethernet LAN ports, a 7.1 channel audio jack and a Wi-Fi wireless adapter. The design of the ASRock X399 Taichi is a little bit more striking with the mechanical dial design that we have also seen on Intel based ASRock Taichi offerings. The new X399 motherboards for AMD Ryzen Threadripper processors look great. 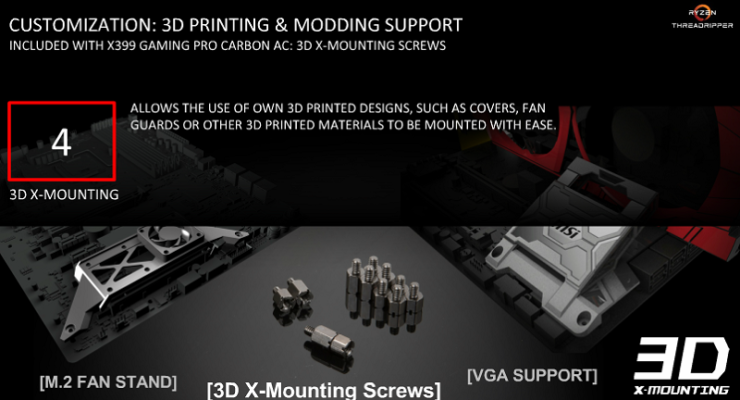 They will cost more than the X370 mainstream motherboards but will deliver insane amount of performance to enthusiasts. Gigabyte already has a page on their official site which shows that the motherboards go on pre-orders in less than 24 hours so those of you who want to be the first to get the boards when they launch on 10th of August should definitely follow the pre-order pages.